If you've ever wondered why Ronald Reagan earned the endearing moniker "The Great Communicator," this special compilation of Reagan's most famous speeches will clearly answer that question. Many people are intellectually brilliant; but few possess the capacity to communicate their ideas and visions in such a way as to captivate and inspire us. That's where Reagan stood out among the rest. Reagan shared his vision of the greatness of America while guiding the nation to unprecedented prosperity and renewed vigor. When he assumed the presidency in 1981, America's economy ebbed with 12 percent inflation and 8 million unemployed. Abroad, America's adversary, the Soviet Union, was expanding its influence. Their nuclear capability surpassed those of the United States and previous nuclear arms treaties were failures. President Reagan's goals were simple: to reduce the size of the federal government, lower taxes, stabilize the economy, restore the belief of the American people in their government — and win the Cold War. When President Reagan left office in 1989, these goals had been achieved. From the time he arrived on the political scene in 1964, throughout his presidency and beyond, Ronald Reagan used his speeches to inspire and reinvigorate the American people. When he spoke, Reagan said, he was "preaching a sermon." 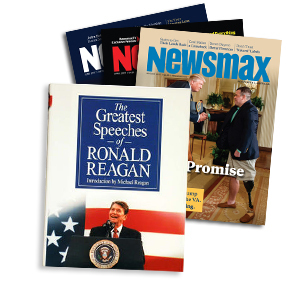 Here in this collection of twenty-eight speeches spanning the Reagan era, you'll read for yourself these inspirational "sermons" and enjoy the many photographs included. From his first speech in the political arena in 1964 to his last letter, informing Americans of his Alzheimer's disease, Ronald Reagan's words show a profound belief in God, freedom, individualism, limited government, and his great love for his country. This book should be a permanent treasure in your personal library!